People with disabilities constitute the nation’s largest minority group, and the only group any of us can become a member of at any time. 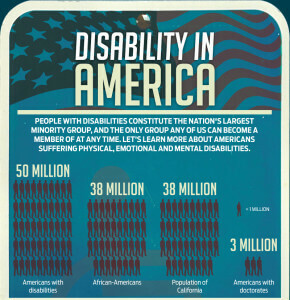 Let’s learn more about Americans suffering physical, emotional and mental disabilities. About 1 in 4 of today’s 20-year-olds will become disabled before they retire. Of the 69.6 million American families, more than 20 million have at least one family member with a disability. While some disabilities are common for children, others appear later in life. Disabilities haven’t stopped these trailblazers from making an impact on life here and around the world.